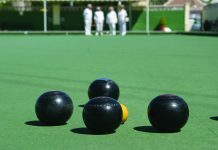 Home Sport Bowls San Luis Bowls Club Report 12.10.18. 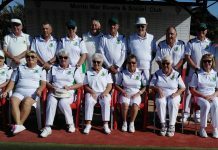 San Luis Bowls Club Report 12.10.18. 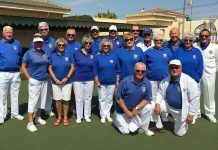 This 3 day competition was a great challenge to the 24 participating teams because of the format, 6 ends each: rinks, 2 woods ladies pairs & 2 woods men’s pairs match. Some of the group winners were not known until the last shot was played, points & shot difference were so close! 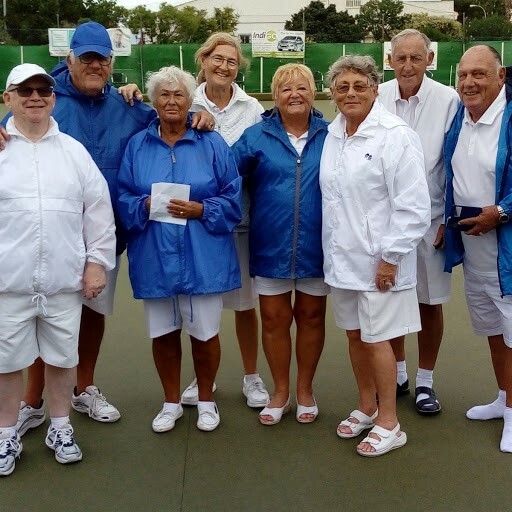 The last morning matches were played in cold, wet, miserable conditions but fortunately it improved for the afternoon semi finals, between group winners (A) Kevin McKenna, Pam Lockett, Sheila Cammack, Les Bedford, who beat group (B) winners: June Jones, Sabrina & Russell Marks, Keith Jones. Group (C) winners: Jan & Brian Pocock & Sally & Roy Cordell beat group (D) winners: Colin Jackson, Kath Reid, Ann Holland, Giuseppe Galelli. 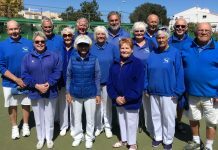 The final, between Pam’s San Luis team & Jan’s San Luis/Greenlands team ended in a clear win for Kevin, Pam, Sheila & Les. Thanks to all the players & hardy supporters, sponsors Avalon, Keith for organizing the event & Jan for organizing the raffle & tombola & anyone else I’ve missed! 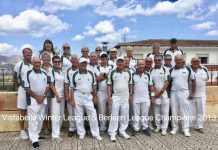 Wednesday 10th Winter League home v Vistabella, a very close match, good result; 9 pts-3, shots 95-80. 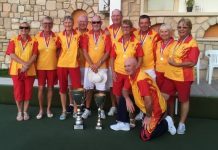 Winners: Pam Lockett, Bill Webb, June & Keith Jones 23-17, Shirley Verity, Ray Clarke, Sabrina & Russ Marks 27-14, Jan Pocock, Keith Phillips, Dave Blackie, Scott Malden 19-17, Kath Reid, Giuseppe Galelli, Neil Morrison, Ian Kenyon 14-14. 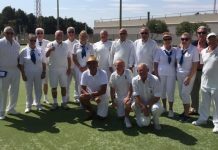 Berleen match conceded by Vistabella due to an accident to VB team member. 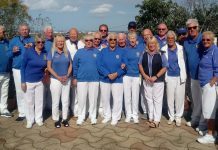 Lynne Morris, Ray Clarke, Tom Hill 15-13, Colin Jackson, June & Keith Jones 19-15, Kath Reid, Pam Lockett, Ian Kenyon 22-4, Steve Simmons, Sheila Cammack, Giuseppe Galelli 24-9, Margaret Morrison, Keith Phillips, Neil Morrison 20-18. SL Tigers away v EI Claymores had a tough match + unfortunately had to concede a game due to illness; 2pts-10, 53shots-80. Winners: Pat Bird, Irene Everett, Peter Fuller 17-12. SL Leopards at home, had another hard match v a strong MM Matadors team; 2pts-10, 71shots-113. 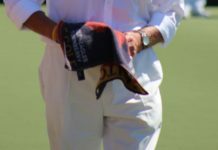 Well done to: Ian Ross, Ken Dullaway, Malcolm Ayton 25-18. SL Pumas home v Greenlands Elms had some close games, 93shots-93, 5pts-7. 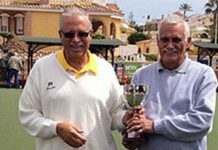 Winners: Pat Barnes, Chris Lythe, Ralph Jones 36-13, Allan Lever, Mario Cavilla, Harry Epsom 17-15. 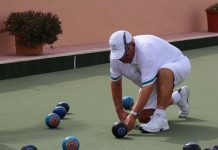 For SLBC information, checkout the club website: www.sanluisbowls.byethost7.com or contact June Jones, Club Captain: 691903773.